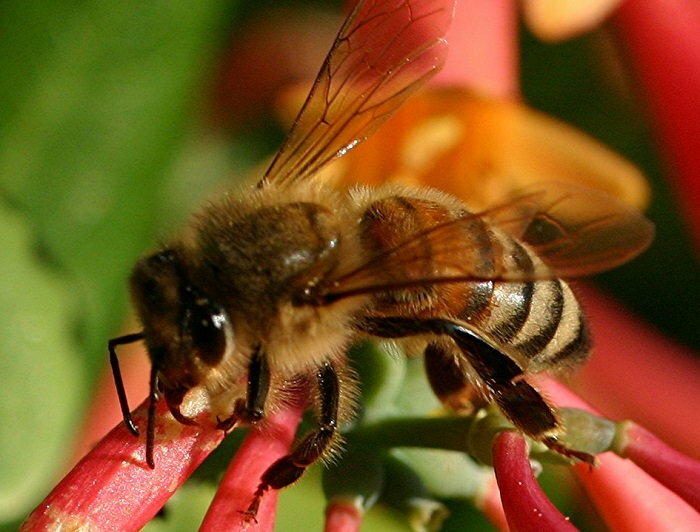 You can attract and protect honeybees and other important pollinators in your garden. Feed them. Shelter them. Don't kill them. Sound simple? It really is! We've all heard about Colony Collapse Disorder and the need to protect Honeybees in North America. Other pollinators also need our encouragement, including other bee species and many little wasps and flies that may go unnoticed in our gardens. The more little pollinators we have buzzing around, the more fruit we'll harvest from our trees and the more color we'll have next year from reseeding annuals. What can we do to encourage and protect pollinators in our gardens? The answers may be simpler than you'd suppose. I'm sure you've noticed bees and other insects buzzing around your flowers, and you've probably noticed that they have some especial favorites. The names of some plants makes it obvious -- Bee Balm (Monarda), Agastache ‘Honey Bee Blue', Honeysuckle. Diversity is key. If you have lots of different plants with different bloom times, your garden will feed the bees from early spring through fall. 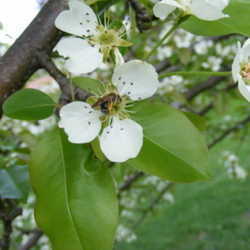 Bees love fruit orchards, but they visit other trees and shrubs also. Varieties of Red Maple, Redbud, Tupelo, Rhododendron, Privet, Abelia, and others are on the menu during their blooming periods. Good nectar plants for butterflies will generally attract other pollinators, so check out lists of "butterfly plants" for your area. Butterfly bush (Buddleia davidii), Milkweed (Asclepias sp. ), Pincushion Flower (Scabiosa), Verbena bonariensis, Phlox panticulata, and Asters are all excellent for attracting both butterflies and bees. If you let a few of your herbs bloom rather than pinching back every plant for culinary use, you'll find pollinators love them too - especially Lavenders, Mints, Catnip, Basils, Borage, Sages and Salvias. Clover is more than a nuisance to keep out of your lawn. Honeybees and other pollinators adore clover, and it has a long bloom season. White or Dutch Clover makes an excellent "green mulch" between garden rows to keep down weeds and add nitrogen to the soil (just till it in at the end of the season). Bunnies rarely seem to bother my other plants if they have plenty of tender clover to nibble. Both white and red perennial clovers make excellent orchard ground covers. The more pollinators you attract to your orchard, the better your harvest will be! A nest of aggressive yellow jackets under the back stairs is a hazard, but don't discourage bees and wasps from nesting in other areas of your yard. Different pollinators have different requirements, from the hollow tree favored by Winnie the Pooh's favorite honey bees to the mud that daubers use to construct their organ-pipe nests. Providing shelter is often as simple as not taking away shelter or materials that they could use, and not automatically knocking down nests when you see them. Many species of bees build nests in the ground, and one of the best ways to make your garden more bee-friendly is to limit your use of mulch, black plastic, and landscape cloth. If you like the look of mulch, perhaps you could strike a compromise. Mulch along the front portions of garden beds and along pathways, and leave bare dirt, leaf litter, or ground covers on less visible areas. Orchard Mason Bees are one of the easiest pollinators to attract by providing housing. Making bee houses is quicker than building bird houses, and they can be made from blocks of scrap wood (don't use treated lumber). With a 5/16 inch bit, drill holes 3 to 5 inches deep but not all the way through the block. Wrapping blocks with chicken wire helps protect the bees from birds. Secure them to the south sides of buildings, fence posts, or trees, and leave them up until at least November. Orchard Mason Bees are first rate pollinators and are especially valuable in areas where honey bee populations have dwindled. The fewer insecticides you use in your yard and garden, the more beneficial insects and pollinators you'll find out there. This doesn't mean you have to go totally organic in order to protect pollinators. Integrated pest management is a common sense approach that includes spraying only when needed (when you see a problem rather than on a schedule), and spraying the smallest amount possible of the least harmful pesticide that will take care of the problem. If you change your goal from "zero bugs on my precious plants" to "I can deal with a few bugs, as long as they don't overwhelm my plants," the amount of toxin you spray around your yard will drop dramatically. That's better for the pollinators, better for the beneficial predatory insects, better for your pets, and better for you. If and when you must spray to control an infestation, spray during a time of day when most pollinators are inactive. This generally means early morning or late evening. If you spray your garden when bees are happily buzzing from flower to flower, you're going to kill a lot of bees. If you spray while the bees are snoozing, the bees won't be flying through toxic mist or landing on blooms wet with chemicals. Take steps to minimize drift when you spray. Less drift means the spray goes only on the plants you're trying to protect and doesn't kill bees visiting other plants nearby. Less drift also means you save money by using less spray. Using the largest droplet size possible rather than a fine mist and spraying only when the air is calm (winds less than 10 mph) will minimize drift. 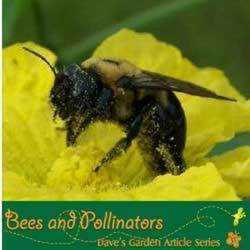 Protect pollinators! Attract them and feed them by including a good diversity of nectar plants in your garden. 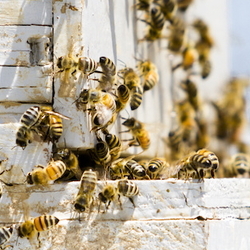 Shelter them by encouraging their hive building efforts and by putting up bee houses. Don't kill them by overusing pesticides or by spraying during the day when they are most active. Encouraging beneficial insects helps the bees, helps your garden, and helps ensure our future. and look for Lois Tilton's upcoming article on Orchard Mason Bees. Also, Tamara Galbraith recently wrote a series of articles on Integrated Pest Management. Plants for Year-Round Bee Forage, list from the University of Georgia's Entomology Department.